SweetCoupon is the PUP that uses misleading techniques to prevent removal. Use Reimage to locate malicious components and get rid of them faster than with uninstall instructions. A full system scan blocks virus reappearance and prevents traffic to malicious domains. How can SweetCoupon hijack my computer? How to remove SweetCoupon virus? SweetCoupon is another program that has clearly deserved being included to the categories of 'adware' and 'potentially unwanted program'. We say so because users are constantly complaining that this program infiltrates computers without any permission asked and then initiates various modifications. It is known that SweetCoupon travels around bundled with free software. Therefore, you may notice its ads only after you reboot your computer. The most obvious sign notifying about its infiltration is constant ads that contain various coupons, discounts, price comparisons and so on. As its developers claim, such alerts help people save their time and money while shopping online. We can assure that you won't save neither time, nor money. In fact, this program might cause you the opposite result. 'Ads by SweetCoupon' and similar notifications may trick you into clicking them and then redirect you to suspicious websites. However, sometimes it might be difficult not to do so because they appear in an extremely annoying manner and straight on your path. Please, be very careful with SweetCoupon redirects because you can never know what website you may be redirected to. In addition, the use of this browser add-on may lead you to serious privacy-related issues. That's because this plug-in may install tracking software alongside that may monitor your browsing activities. Therefore, if you want to avoid this, the only thing that you can do is to remove this adware from your computer. Since it is promoted as a legitimate and handy tool, some people get tricked and download this program voluntarily. Of course, it is promoted on its official site but download button is inactive and you won't be able to download it there. It immediately signals that something is wrong with the program. And it certainly is. In fact, it spreads with a help of freewares and shareware. To be more precise, it can be integrated into various questionable download managers, video converters, music players and other suspicious software and installed alongside them without users knowing it. This is a tricky distribution method that enables quick and easy spread of various adwares and potentially unwanted programs. It cannot be stated that users are not informed about additional tools that are attached to the program that they need. The main problem is that this information is cleverly hidden. 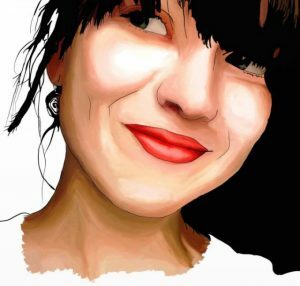 As a consequence, users who do not pay enough attention to the installation process skip this information and accept to install various extensions, plug-ins, add-ons or toolbars unintentionally. To avoid this, always opt out for Advanced or Custom installation mode, follow the process step-by-step, and deselect propositions to install unfamiliar tools, such as SweetCoupon. If you have already failed downloading free program and installed this browser add-on alongside, you should remove it in order to keep your computer safe. Here, look for SweetCoupon or any other recently installed suspicious programs. Wait until you see Applications folder and look for SweetCoupon or any other suspicious programs on it. Now right click on every of such entries and select Move to Trash. When in the new window, check Delete personal settings and select Reset again to complete SweetCoupon removal. Once these steps are finished, SweetCoupon should be removed from your Microsoft Edge browser. Here, select SweetCoupon and other questionable plugins. Click Remove to delete these entries. Now you will see Reset Firefox to its default state message with Reset Firefox button. 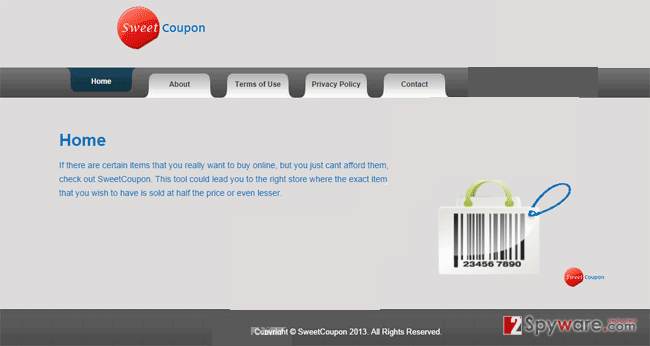 Click this button for several times and complete SweetCoupon removal. Here, select SweetCoupon and other malicious plugins and select trash icon to delete these entries. Click Reset to confirm this action and complete SweetCoupon removal. Here, select Extensions and look for SweetCoupon or other suspicious entries. Click on the Uninstall button to get rid each of them. Now you will see a detailed dialog window filled with reset options. All of those options are usually checked, but you can specify which of them you want to reset. Click the Reset button to complete SweetCoupon removal process. You can quickly scan the QR code with your mobile device and have SweetCoupon ads manual removal instructions right in your pocket. How did you remove SweetCoupon ads?